This is a plastic professional electric knife sharpener that is worth every penny. This unit is incorporated with three stage sharpening mechanism for professional outcome. The sharpener has a reputation of fast-sharpening kitchen as well as sport knives. The unit is equipped with interchangeable blade guides that provide the user with optimum sharpening angles. The sharpener’s blade selector conveniently adjusts the guides to the best angle required for precision sharpening. This sharpener provides you with not only an easy way to sharpen your knife, but also an automatic one. The device involves a three-stage sharpening process. Presto 08810 professional provides you with the grinding power to work on your blunt kitchen knives, sport knives among other knives. It provides you with a three-stage sharpening mechanism for expected results. With this unit, you do not need to guess the sharpening, since the blade selector provides you with means of adjusting the guides for precision sharpening. You can conveniently select thin for sharpening light blades such as paring knives and fillet. You can select medium for sharpening chef’s knives as well as standard kitchen knives. In addition, you can select thick for grinding and sharpening hunting knives. It’s very easy to use the sharpener; all you need to do is draw your knife through each slot for a given number of times to attain precision sharpness. The sharpener features three stages, which make certain that your knife achieves the correct sharpness. The first stage requires you to start sharpening your knife with a sapphirite coarse grinding wheel, which creates the appropriate angle. The second stage requires you to continue sharpening your knife with a sapphirite medium grinding wheel, which provides your knife’s blade with a precision edge. In the third stage, you will have to complete the sharpening process with the aid of an ultrafine grit ceramic wheel, which will polish your knife’s blade to razor-sharpness. This product measures 12 x 5 x 4 inches and it weighs 2.4 pounds, making it compact and ultraportable. The device is electric powered, with its power rating being 120 volts, 60Hz. The sharpener is equipped with switch button for on/off. The unit’s blade selector provides you with three options, including thick, medium, and thin. The sharpener’s blade is firm; thus when placed on the surface it does not slide while sharpening. The sharpener sleek, plastic design is unique and very user friendly. The sharpener has a blade selector with three options, including thick, medium, and thin blades. Thick blade for sharpening hunting knives, medium for sharpening chef’s knives, and thin blade for sharpening paring knives and fillet. The sharpener works under a three-stage sharpening process, which employs the use of sapphirite grinding wheel. This ensures that by the time your knife is completely sharpened, it would have gained razor-sharpness. The unit’s utility is high, since it provides you with more than enough features, including a blade selector, a switch button, and a three-stage sharpening process. All these make certain that your knife sharpening experience is amazing. The sharpener’s design is simple and very easy to use. The design is powered by electricity, which rates at 120 volts, 60 Hz only. The plastic material ensures that the unit appears flawless, and it also makes it attractive to the eye. At times it might be impossible to sharpen any of your knives without the sharpener leaving a divot on your knives’ blades, particularly at the location where the grinding wheel contacts the blades. Presto 08810 professional is the ideal choice for a person who has in his or her possession knives of different thickness. You do not need to incur extra costs of buying individual knife sharpeners for your knives, due to the difference in thickness. The blade selector installed in this device will serve three purposes from a single unit. Well, if precision sharpness is what you are after; then this is the correct unit to buy. This is so since the sharpener operates under a three-stage sharpening process, which ensures that the end result is razor-sharpness. This sharpener works great for a manageable price. Those who are after electric-powered knife sharpeners with greater sharpening power should buy. This is the appropriate knife sharpener for your knives. 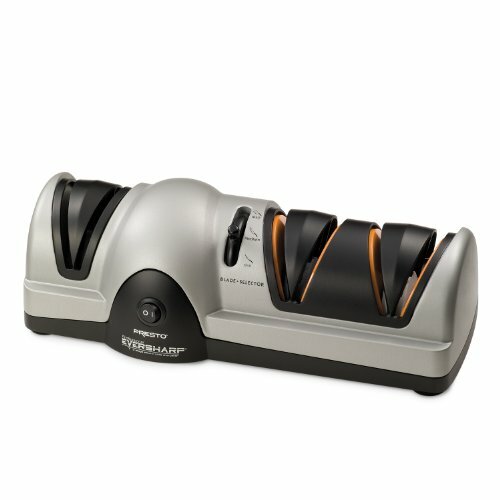 This four-star knife sharpener features a sleek, plastic, electric-powered design. The unit presents you with no guess sharpening; therefore, the moment you hold your knife and insert it for sharpening, you should expect the best outcome. You do not need to waste time trying to narrow down a list of potential knife sharpeners, since the right choice is Presto 08810. The instructions/ direction of use are very simple and precise; therefore, you have nothing to worry about, even if it is your first time to use the device. The automatic blade guides will ensure that your knife is held at the perfect sharpening/ grinding angle.